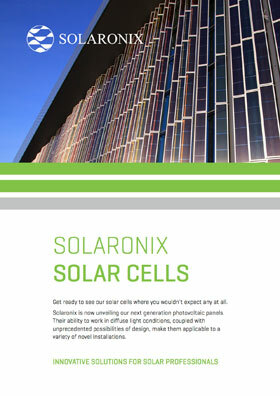 Solaronix is developing a new generation of photovoltaic panels based on Dye Solar Cell technology. Our models offer unprecedented possibilities in terms of customization and integration. The main goal of Solaronix has always been to bring innovative solutions to solar energy in the form of new applications, reduced costs, or easier fabrication. In that quest our efforts are directed towards the development of easy-to-manufacture photovoltaic solar cells using ubiquitous industrial equipment and readily available components. Our vertical expertise in photovoltaics comprises: materials, surface treatments, assembly techniques, testing equipment, and performance assessment. This portfolio of competences allows us to develop innovative solar cell prototypes that can be further produced on our pilot line and integrated into application test cases. Solaronix has been a pioneer of Dye Solar Cell technology since its inception. We believe this type of solar cell demonstrates unmatched features that open solar technology to a host of innovative applications. Thanks to in-house production and supply of the specialty chemicals and components of Hybrid and Dye Solar Cell, we pioneered the fabrication processes for Dye Solar Cell photovoltaic panels. The result is Solaronix' palette of Dye Solar Cell flavors. Our models come in a variety of colors and transparencies, offering unprecedented design flexibility for device or building integration. Their low light sensitivity makes them attractive for diffuse light conditions, including indoor applications. Because our goal is to use industrially proven and omnipresent machines and processes, while keeping manufacturing energy needs minimal, the energy payback time of our solar cells is reduced to a few months instead of several years. Most of the material in our solar cells is glass. Indeed, the layer absorbing light is extremely thin, which keeps materials usage to a minimum. They don't use toxic heavy metals they are free of cadmium, tellurium, selenium, indium, and gadolinium, elements often found in other solar cells. The ruthenium pigment that is present in extremely small quantities has been show not to be mutagenic. Equally important, feedstocks of the materials employed in our solar cells are abundant. After glass and sealant, the most used ingredient is titanium dioxide, a compound that's commonly found in other industries such as paints or cosmetics. The amounts of precious metals we use (eg. ruthenium and platinum) are so tiny that they would only represent a small fraction of their mined sources. Photovoltaic panels are made to transform sunlight energy into electrical energy, but it takes some conventional energy to make them as well. The energy payback time is the duration it takes for a solar panel to produce as much energy as it took to make it, preferably as short as possible. The electricity produced afterward is then truly renewable. Because the materials used are low cost, and the manufacturing processes are not as energy intensive, the anticipated energy payback time for dye cell products is significantly truncated to several months instead of several years. The production of our solar cells was meant to be as simple as possible. That's why our pilot production line employs ubiquitous fabrication equipment that require significantly lower capital expenditure compared with other photovoltaic technologies. Manufacturing installations are viable at a smaller scale, which in turn allows for customized products and for production sites closer to their integration, reducing transportation costs. A unique selling point: our solar cells come in different colors and have adjustable shapes and transparencies. This unprecedented set of features opens the way to new and innovative solutions where photovoltaic panels become an aesthetic item as well. Building integration can be facilitated by a clever use of incoming light for both energy conversion and passive lighting. The characteristics of photovoltaic panels are given for standardized ideal conditions at 25°C under full sun illumination. We all know that reality is very different more often than not. Cloudy or hazy days, partial shading, sunrise and sunset, higher latitudes, all conditions when sunlight is not as strong. On the other hand, clear skies will elevate panels' temperature much higher than 25°C. 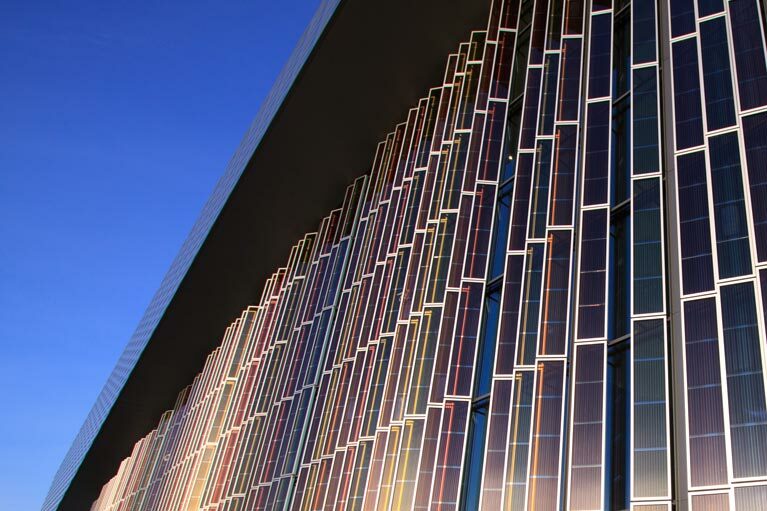 Our solar cells are able to harness diffuse light more efficiently. They exhibit superior performance on cloudy or hazy days, and they generate power longer throughout the day. What's more, their performance is not degraded by rising panel temperature, unlike other photovoltaic technologies. It's no surprise that solar panels must be facing the sun to be most effective. In practice, photovoltaic panels cannot always be installed at the best orientation because of roof inclination or cardinal orientation. However, our solar panels demonstrate a lower angular dependence, which makes them eligible for facades or similar places where the angle towards sunlight is not optimal. For the same reason our solar panels provide smooth energy production from sunrise to sunset, and over the year as the sun's path changes. Not only do our panels work well in diffuse light, there spectral response also widely overlaps with those of light sources found in homes and offices. They produce a very good power output in low light applications. One can imagine numerous indoor applications of our solar cells: chargers, sensors, standby power, etc.